I’ve always found that the moon is the perfect introduction to the night sky for kids. It’s easy to observe; you don’t need any special equipment to see it. Plus, there are so many kid-friendly resources to help you learn about it. 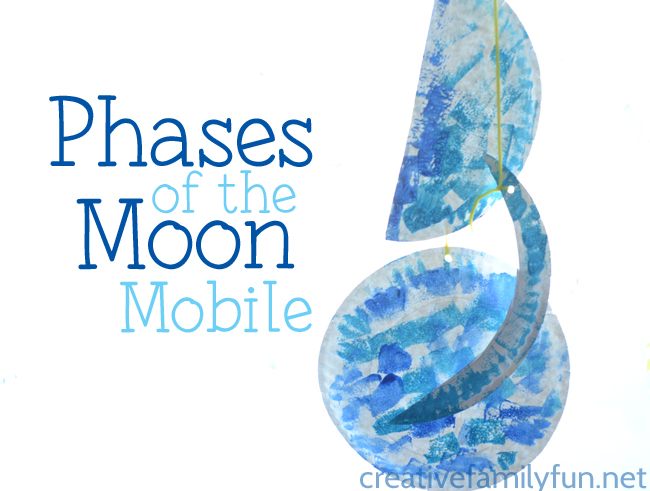 Today’s project is all about the phases of the moon. We took a little learning and turned it into a kids craft project so you can have the moon in your room both day and night. 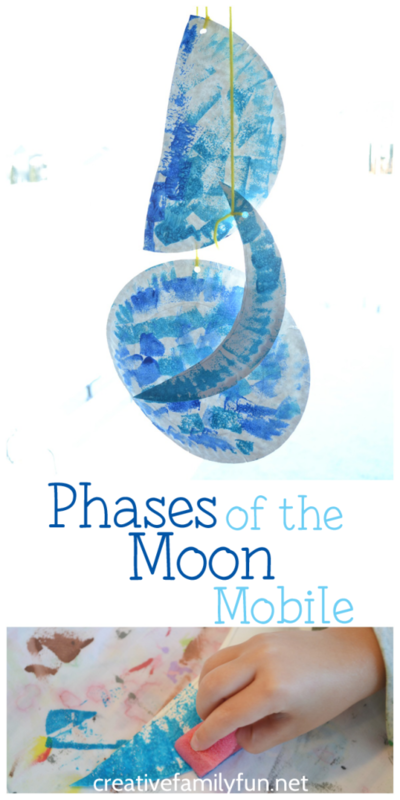 This phases of the moon mobile is easy and takes only a few supplies, which you may already at home. Every night the moon looks different. Over the course of a lunar month (approximately 30 days) the moon goes through several phases, from new, to crescent, to quarter, to gibbous, to full. It changes because the moon rotates around the earth. You can get a detailed but kid-friendly explanation here from NASA. To get excited about the moon and to do a little hands-on learning, we’re going to create a simple illustration of the moon phases. For this moon mobile, we made three moon phases. We made a full moon, a quarter moon, and a crescent moon. You can make as many phases as you would like. For the full moon, leave one paper plate whole. 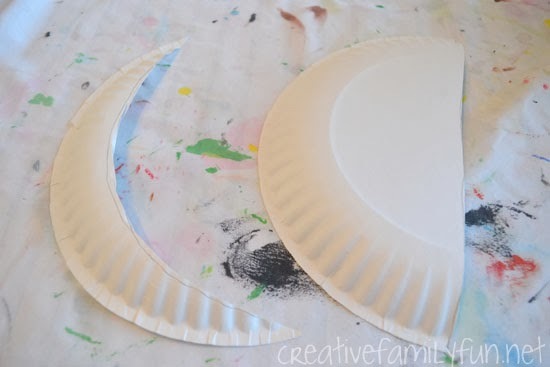 Cut the other paper plate in half. 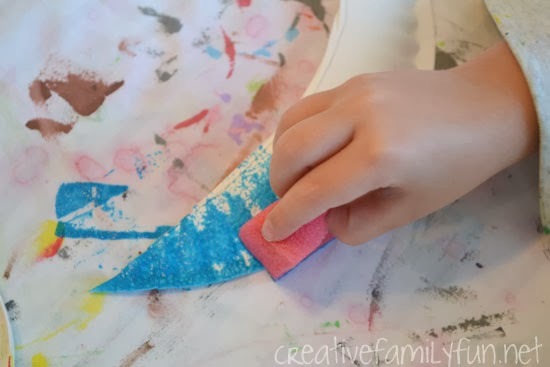 Use one of the halves for your quarter moon and cut the other half in the shape of a crescent moon. 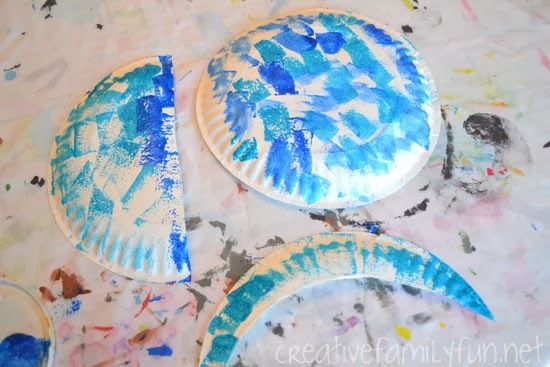 Using your blue paints, sponge paint your three different moons. We only had two different shades of blue so that’s what we used. Use as many shades of blue as you would like, or add in grey and white for a different color scheme. If you only have one shade of blue, use white paint to lighten some of it. I cut up a sponge into small squares to use for painting. 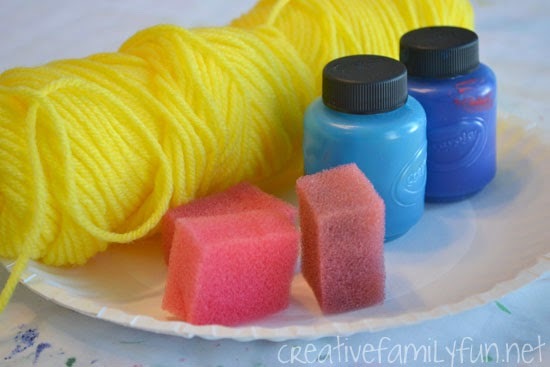 The small squares of sponge are perfect for little hands to use. After your moons have dried, punch a hole in the top of each. Tie a piece of yarn through your hole and again to your coat hanger. I varied the length of my yarn so our moon phases would hang at different levels. Once you’re done, hang your phases of the moon mobile up in your room and wow everyone with your new knowledge of the moon. Watch this beautiful video on YouTube. Set to the soundtrack of Beethoven’s Sonata No 14, an animated moon works its ways through all of its phases. Stop by Kids Activities Blog for another fun project you and your kids can do to chart the moon and learn about the different phases. MoonConnection.com has a moon phase calendar you can use for reference. You can switch between the northern hemisphere and the southern hemisphere to get the correct moon calendar for your location.